What do you get when you combine three Korean instruments (changgo, gayagum & taegum), a Japanese instrument (shakuhachi), a piano, an electric guitar and a synthesizer? 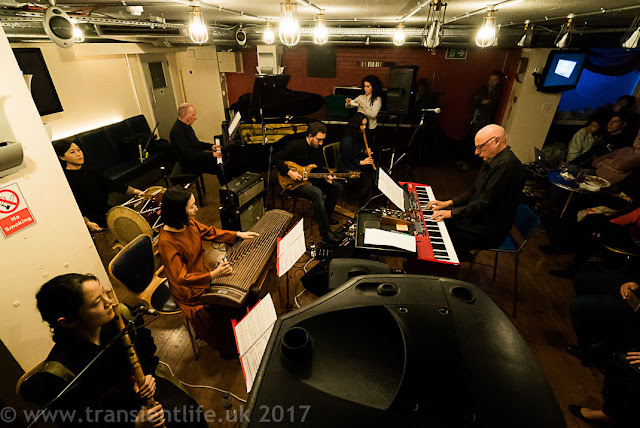 That was the question being asked by Tuesday's (18 April 2017) event, Presence through sound, at Club Inégales, the music venue in North Gower street devoted to music in all its guises, directed by composer Peter Wiegold. At Tuesday's event, three members of the club's resident band, Notes Inégales, Peter Wiegold (keyboards), Martin Butler (piano), Joel Bell (electric guitar) were joined by four guest musicians, three from Korea, Yi Ji-Young (gayagum), Hyelim Kim (taegum), Jihye Kim (changgo), and one from Japan, Kiku Day (shakuhachi), to perform separately and together, showing how musics from diverse cultures could come together in an invigorating whole. Club Inégales is a basement club in North Gower Street, situated below a firm of solicitors (whose support for the club is invaluable), and the club runs regular events where guest musicians from a wide variety of cultures and styles join with the resident band. Tuesday night was busy, with 60 or so audience members filling the club. It has a nicely casual atmosphere, and audience members are able to buy drinks and Indian food before the music starts. On Tuesday we started with a short improvisation from Peter Wiegold, Martin Butler and Joel Bell, which seemed to use late-night jazz-inspired riffs but combined them in intriguing ways, creating something rather evanescent which coalesced gradually into a more structured yet affectingly fluid piece. This was followed by a short solo from each of the guest musicians. Kiku Day played the shakuhachi, a traditional Japanese bamboo flute (played upright) with five holes. She started with an improvisation which used a great deal of breath with only hints of pitch, but creating something fast and vibrant. This led directly into an excerpt from a traditional Japanese piece, again with a striking combination of pitch and breathy tone. The instrument seemed to have an intriguing number of possible variables available to the player, and Day created a very melancholy mood, evocative of Japan. The next player was Yi Ji-Young who played the Korean gayagum, a zither-like traditional instrument (you can read more about the instrument at Yi Ji-Young's website). 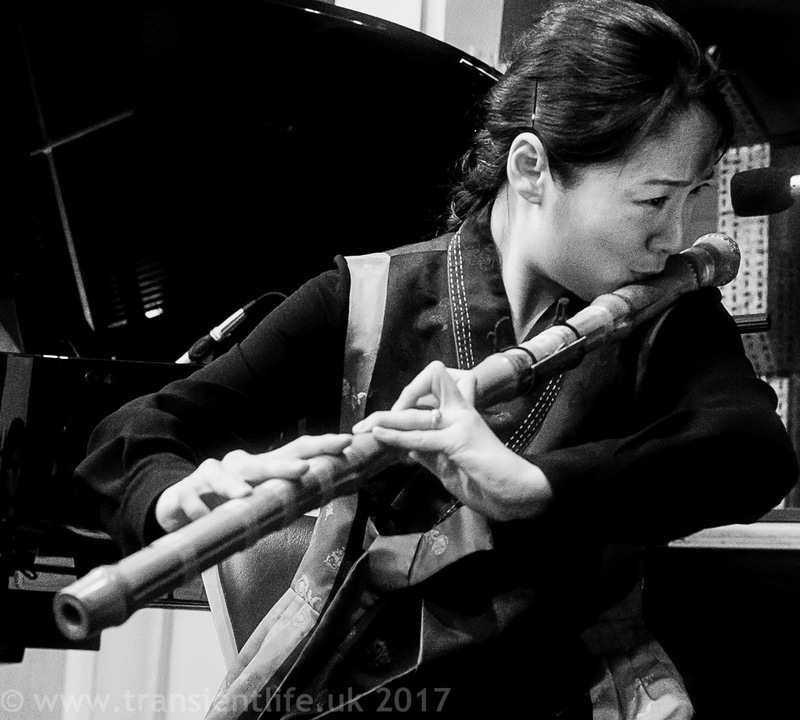 Yi Ji-Young showed us the impressive range of timbres, tone and style available from the instrument by improvising on one note. She warned us that this could be dangerous, and indeed at one point the string did twang off the supports dramatically. She created a virtuoso improvisation full of rhythms and timbres. Hyelim Kim played the taegun, a Korean bamboo flute. This is played transverse and has a large embouchure and six finger holes, along with an extra hole covered by a membrane so that when the player over-blows it creates a buzzing sound. 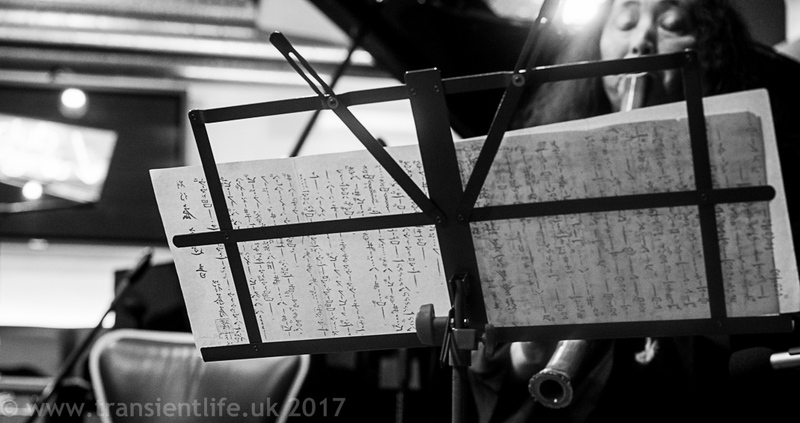 Indeed Heylim Kim was able to produce a remarkable range of sounds, She played a late-night piece of Korean court music, very evocative and very strong in timbre because of the extra buzzing sound, yet with a translucent quality too. Finally, Jihye Kim performed on the Korean changgo, along with a gong. She started with some formal, ritual elements on the gong before moving to the drum-like changgo (at one point rather impressively playing both). Considering she was only using two hands she managed to create a remarkable web of complex drumming sounds which culminated in a spectacularly fast section. After a short interval all the musicians came together to play a group of pieces. Peter Wiegold had written three new piece, Changgo changgo One, Two, and Three, but he emphasised that these were only skeletons around which the players could build the music. The first was multilayered over a rhythmic sort of ground, interweaving timbres and textures which different instruments coming to the fore. The second started with drum rhythm and guitar before layering other instruments over to create something busy, yet never loud, and full of subtle textures. The third was closer to cool jazz, with a lot of breath and texture over a basic rhythm. Next came a piece, Imortality, which Wiegold originally wrote for the club when the guests were a group of Indian musicians and which is based on a verse by Rabindranath Tagore ('let the dead have the immortality of fame, but the living have the immortality of love', from Stray Birds, Tagore's own translations from his original Bengali ). A mesmerising and thoughtful piece. Rif One had originally been written by Wiegold for the National Youth Folk Ensemble, again multiple layers over repeating rhythmic figure creating something complex and entrancing.